Anthony McCall’s first solo show in Ireland presents a synopsis of his career, encapsulating the range of his concerns and the development of his enquiry in a concise exhibition of five works made over a thirty-year span. This lean selection is a potent one, investigating the intersections between drawing and sculpture, touching on the histories of happenings and minimalism, immersive installation, performance and land art. 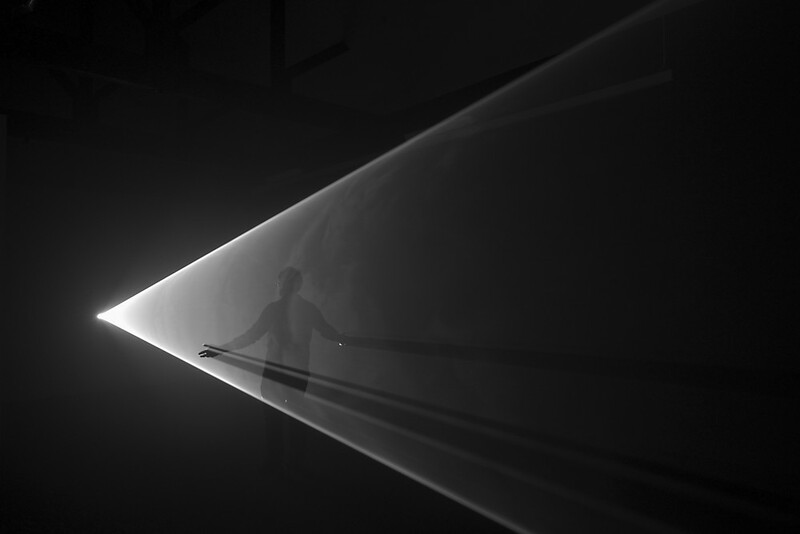 Anthony McCall: Line Describing a Cone (1973). Digital projector, hazer. Installation shot taken at the sixth minute, Lismore Castle Arts, 2017. © Lismore Castle Arts. A key figure in the avant-garde London Film-makers Co-operative in the 1970s, McCall’s earliest films are documents of outdoor performances, represented here by Landscape for Fire (1972). The film records a field of small fires systematically kindled in the darkness, and neatly marries the elemental with the haute-modernist grid format. McCall has described Landscape for Fire as the catalyst for his light projections. The experience of making the work prompted him to investigate the processes of film – to look at the sculptural qualities of projected light rather than simply to think of film as a means of documenting his performances. And so the now legendary Line Describing a Cone was devised in 1973. What is exhibited in Lismore Castle Arts, however, is Line Describing a Cone 2.0 (1973 – 2012). When McCall originally began showing these light sculptures in the 1970s, his venues were often grungy warehouse spaces, where people could (and did) smoke, and the air was thick with dust. This palpable atmosphere allowed the beam of projected light to manifest as a tangible thing, taking on weight, allowing him to cast lines and seemingly solid planes out of the air. However, as his work moved into more traditional gallery spaces, and the air became cleaner, the light works became less easy to realise. It was only in the 1990s, when he discovered hazer machines – a kind of dry ice emitter – that he could re-stage and revisit these works, this time using digital projectors rather than 16mm film. The haze machines lend the light works a distinctively aestheticized quality in comparison to (what I imagine to be) the rougher magic of the 1973 iteration. The controlled emission of oil- or water-based fluids imbue the projected light with a gorgeous, mobile surface quality, like flumes and eddies of watered silk. All of this imparts the work with a certain uncanny glamour; the impalpable is made apparently solid as air is given a weight and density, like an aesthetically seductive fog that haunts the room. The affective impact is beguiling and the performative aspect of the work is still very much in evidence – children dance in and out of the sheets of light, and people dip their fingers in the beams. Swell (2016) picks up where Line Describing a Cone left off in 1973, and one could argue that there is little development between the two works, bar the fact that digital technology allows him to achieve more intricate and complex progressions. One could also argue that the formal simplicity of Line Describing a Cone, its gradual evolution of the cone of light, familiar from cinema projection, has a satisfying conceptual neatness, whereas the later work is more elaborate, but re-treads much of the same ground. These works are utterly spectacular, with all the ramifications this word implies in terms of size, scale and visual pleasure – and they are achingly beautiful, aligning sheer sensuality with satisfying rigour – but the overwhelming sensory impact induces an almost narcotic effect, as borne out by the nearly hysterical, physical joy exhibited by the visiting children. A certain nagging, curmudgeonly voice whispers that this veers close to a mere entertainment, but it is a wholly transporting one at that. The curators have chosen works that neatly bookend McCall’s career so far – Landscape for Fire (1972) is counter-posed with Crossing the Elbe (2015), a massive public intervention in Hamburg. Here, McCall’s beams are writ large against the sky as arc lights carve the city into quadrants in a way that could only be fully appreciated from the air. There are also inevitable connotations here with search lights and the Allied bombing of Hamburg during the Second World War. Arguably, each of these works stages drawing as performance. This is made explicit in a rather po-faced (tongue in cheek?) Five Minute Drawing (1974/2008), staged before an audience. Here, McCall and an assistant carefully affixed sheets of paper to the wall, fastidiously adjusting the angle of a taut length of string before snapping it against the paper to leave a sharp charcoal trace, to resounding applause. This piece seems somewhat arch and a little flat in comparison to the spectral poetics of the solid light works. The difference seems to stem from the lack of interactive possibility; Line Describing a Cone and Swell extend a beguiling invitation – to play with light made palpable. That work of such economy can be alternatively categorised as ultra-minimal cinema, solid light sculptures, or interactive installation, testifies to the continuing richness of McCall’s interdisciplinary practice. Anthony McCall was on view, 2 April – 15 October 2017. Sarah Kelleher is a writer, curator (with Pluck Projects) and PhD candidate in History of Art, UCC, Cork. Text copyright Rachel Warriner. First published in Enclave Review 15, Summer 2017, p.4.